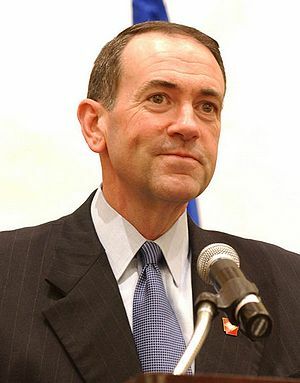 Former Governor of Arkansas, Mike Huckabee entered the Republican race for President in 2008. He was largely considered a 2nd tier candidate, until he came in second in the Iowa Straw Poll. He rose in Iowa and became more well known and later won the Iowa Caucus. He also won a series of southern states on Super Tuesday. He was one of the last candidates to be challenge frontrunner, John McCain, for the Republican nomination. He left after defeat in all four states on Super Tuesday II. He received the notable endorsements of actor Chuck Norris, former presidential opponent Duncan Hunter, and Christian psychologist Dr. James Dobson. This page was last modified on 12 July 2016, at 18:57.